We provide in-house digital X–ray service so you never have to be referred to outside laboratories. This makes your visit to our clinic shorter and more convenient. Our X–ray service is the latest in the industry: our machines could churn results faster than ordinary X–ray equipment; they are also safer for your child because they offer 80% less exposure to radiation. Panoramic x–ray serves as an important evaluation tool and helps in diagnosing dental anomalies which may be undetected during a routine dental exam. 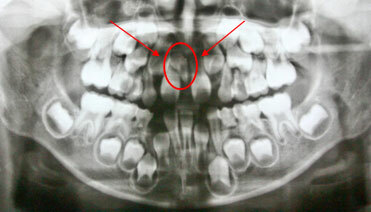 *This is a panoramic x–ray of an eight–year old patient with odontoma. Odontoma was surgically removed and tooth was orthodontically pulled out. 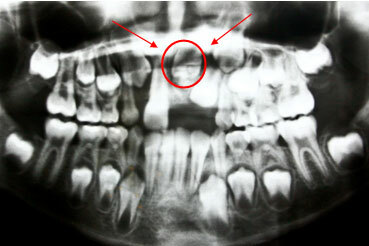 *This is a panoramic x–ray of a six–year old patient with an extra inverted tooth which was surgically removed to close the gap of the incisor. 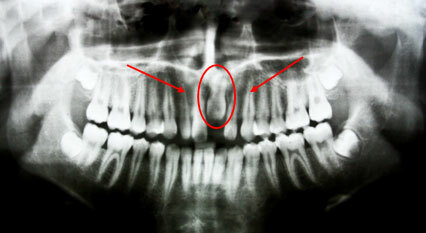 *This panoramic x–ray shows an impacted central incisor which is dilacerated or has a bent root that needs to be surgically and orthodontically pulled out.